Who wouldn't like to make things easier to work with? 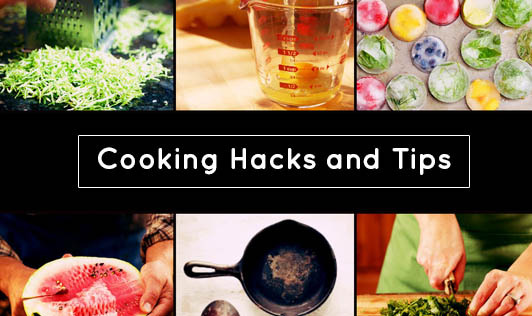 Here are some hacks and tips to make your time in the kitchen easier and enjoyable! • Couldn't find peeled garlic and have to peel them yourself? Just smash the garlic cloves with the side of a knife. The skin will just fall apart. • Rub a lime on the counter with the palm of your hand to get more juice. If the lime is cold, microwave it for 5 seconds. • To prevent water from boiling over while cooking pasta, place a wooden spoon on top the vessel. • Love pomegranate but hate to peel it? Cut the fruit along the middle, hold it in your palm, flat surface down and whack the fruit with a wooden stick. The seeds will fall in no time! • Added too much water to your gravy? Loosely tie raw rice or pasta in a cloth and place it in the gravy. The rice/pasta will absorb excess water. • To keep cut cake fresh, place a slice of bread and secure it with toothpicks. Your cake will remain fresh and moist for days! • Can't get the stink off your hands after cutting garlic, onions and green chillies? Just rub your hands with stainless steel. The steel will bind the molecules removing the stink from your hands instantly!